When I was 11 years old, my father took my 15-year-old-sister and me on a cross-country car trip from Tamaqua, Pennsylvania to Seattle, Washington to San Diego, California, and back in 30 days. What I remember about the trip was my father saying, “Here we are at the Space Needle (or Disneyland or the Grand Canyon or wherever), you have 10 minutes, take some pictures, I’m going to the souvenir shop to buy some pennants.” (For some reason, we got into collecting pennants that ended up on the walls of our basement.) My father drove 10,000 miles in 30 days, and I got to see the U.S.A. at 60 miles per hour. Now, that I have journeyed many miles throughout the U.S.A. and have moved to the Philippines, I would like to tell you what I have discovered about our world of growing things. The more I traveled and the more I observed, the more I discovered about trees. Banana trees (technically they are not a tree; they are a grass like asparagus) can be identified by a subtle difference in the leaf shapes. (I can’t tell the difference yet.) But I can tell the difference between the taste of a Lakatan (the sweetest) and a Saba (the meatiest). Did you know that a Pineapple plant is surprisingly short (less than a meter tall)? Apple, with its hundreds of mouth-watering varieties in North America, is actually a gnarly, unimpressive tree. 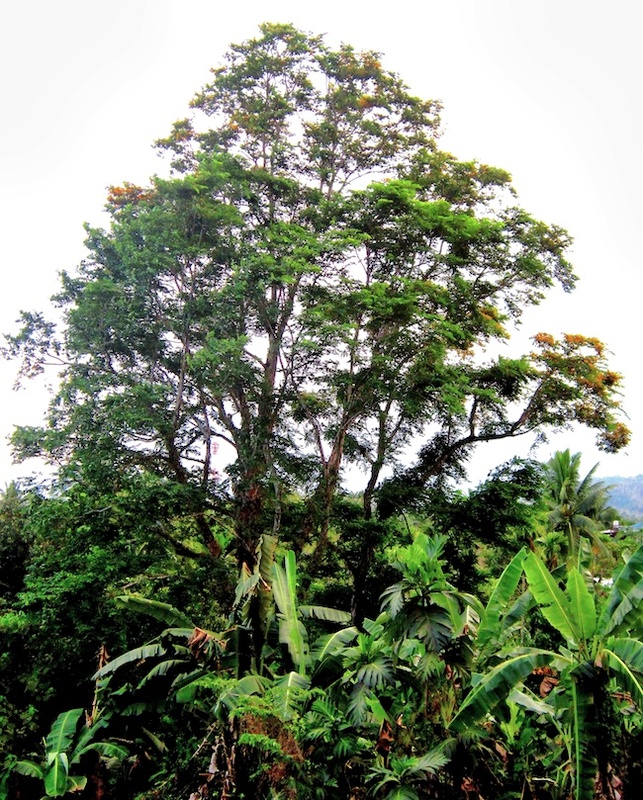 Narra (the national tree of the Philippines) looks like a magnificent oak tree with small willow-like leaves and adorned in the spring with golden flowers. I also discovered many things about plants and planting. In Northern California, where I had my vegetable garden, I started my tomato plants in pots on February 1st, and transplanted them into the ground at the end of May, so that I could begin harvesting in August; the tomatoes were done by rainy season at the end of November. In tropical Philippines, with its all-year growing season, and with almost the same amount of daylight in June as in December, it doesn’t make much of a difference when you start or when you plant something. My first year in the Philippines, I planted Amish Heritage Brandywine Tomatoes (my favorite) on February 1st, and transplanted them on May 30th, just in time for the beginning of rainy season. Tomatoes like water, but don’t like rain. For months, my tomato plants struggled. Finally, one scrawny, weather-beaten, thin vine produced one beautiful Brandywine tomato, in February! It was a delightful triumph. Food, by the way, is a great way to discover the uniqueness of a place. Remember, though, that what you are eating at the table is, actually, dead. When I want to experience truly extraordinary food, I visit a farm, or better yet, I volunteer to help with their harvest. There is nothing more delicious in the world than picking and eating fresh fruits and vegetables. When is something in season? Does it like cold or hot, wet or dry, sun or shade? You will never see these kinds of distinctions on a one-day visit, and or even a one-year stay. This is the main reason overseas volunteer organizations such as the U.S. Peace Corps have few agricultural programs any more. Unless you are a trained agriculturalist, you are not going to “get” the local vegetation, terrain, or weather in a year or two. It will take you at least a year, and, maybe, sometimes, in the second year, you can try to grow some things, but then will you move on. You will probably never see the fruits of your labors. If you want to experience something fast, stand among Bamboo plants that can grow up to a meter a day; or walk in a field of Sunflowers and watch their heads move with the sun; or observe a Rose opening in the morning. Or, if you want to experience something big, stand beneath 100-meter-tall Redwoods (the tallest living trees on earth) or 25-meter-tall, sweet-smelling Tamarinds. And if you want a truly humbling experience, try sitting beside 5,000-year-old Bristlecone Pines (one of the oldest living trees in North America and some of the oldest living things on earth). Robert Frost, the poet, traveled the same path through the woods every day, on foot, by cart, by sled, observing the many small changes all year long. And sometimes, as with Stopping by Woods on a Snowy Evening, he wrote a great poem. B.J. Stolbov is a novelist, poet, short-story writer, travel writer, and personal essayist. He is the author of the novel “Last Fall” (Doubleday) and the book of poetry “Walks” (Foot Print Press). He is currently working on a new novel and on an on-going poetry collection. He lives and works in northern Luzon in the Philippines. An experienced gardener and an aspiring farmer, he is an interested student of the earth. He is a dedicated practitioner of T’ai Chi Chuan and Chi Gong. B.J. teaches English and writing, and is available for writing and teaching assignments. Please feel free to contact him at BJStolbov@gmail.com.